The text of this manuscript concerns the characteristics of different kinds of animals, plants and stones. It seems to have been made for a librarian of the Benedictine abbey at Rochester, and its artist also worked on a Psalter probably made for a London patron; he therefore probably moved around Southeast England. The illumination was left unfinished, however, so it may be that the librarian ran out of money, or that the artist was called away to another project. 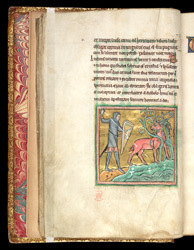 The antelope was supposed to have long serrated horns: a man could capture one if it went to the river-bank and got its horns caught in shrubbery.